This 12V Ride On AMG has been officially licensed by Mercedes. The S63 comes with a high gloss paint finish, working front and rear LED lights, and real rubber tires. Working spring suspension, and forward/reverse shifter control help make for a nice, comfortable and quiet ride. This Kids Ride On Mercedes comes with a 2.4 GHz parental remote control. Giving you the ability to control the vehicle if your toddler can not yet reach the pedals or maneuver the car themselves. When ready, your child can drive this beautiful car around via the working steering wheel and pedals. With startup sounds and horn, FM radio, Micro SD/USB/MP3 inputs listening to your child's favorite music will be a breeze. Length: 48" Width: 25" Height: 20"
See the full selection and prices at http://www.bigtoysgreencountry.com/ This 12V ride-on version of the Mercedes S63 AMG has it All, elegance and class. It comes with S63 AMG insignia and is officially licensed by Mercedes-Benz. The 2.4GHz remote lets you steer/fully control the car if your toddler is not yet able to, allowing for an enjoyable shared experience. Once accustomed to driving on their own, kids can drive this beautiful car via steering wheel and "gas pedal". With realistic features such as bright front and rear LED lights, working spring suspension, forward/reverse shifter, horn/sound buttons on steering wheel, along with FM radio, Micro SD, USB port and MP3 player for listening to their favorite tunes, it'll make for some very entertaining trips around the block. This version has been upgraded with a high-gloss paint finish, and Rubber Tires for a comfortable, QUIET ride. MY 1 YEAR OLD ABSOLUTELY LOVES THIS CAR AND SO MANY PEOPLE ARE ASKING WHERE DID I GET IT SO YOU GUYS SHOULD BE RECEIVING SOME ORDERS WHEN THEY COME IN NEXT YEAR! ONLY COUPLE PROBLEMS I HAD WAS THAT THE AUXILLARY FOR MP3 OR WHATNOT IT DOESNT PLAY LOUD ENOUGH AND THE DOORS DOESNT OPEN! this car is really cool my 2 yr old loves it the paint is so pretty in the sunlight and the rubber tires make for a quiet ride. 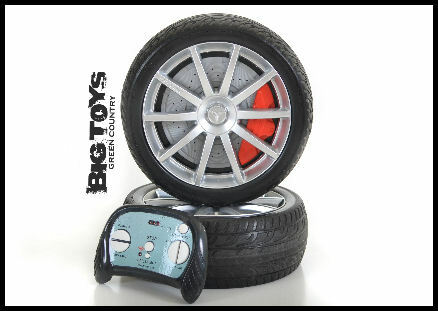 Click the button below to add the Mercedes Benz S63 RC Ride On Car w/ rubber tires -Red to your wish list.